New Delhi, Dec 1: Air quality in Delhi-NCR worsened yet again on Thursday, with at least seven out of 21 monitored regions facing "severe" or "severe-plus" levels of pollution as the wind speed dropped but kept blowing from the stubble burning states. According to the pollution monitoring agencies, the air pollution situation is likely to worsen further over the next three days. On Thursday, the Air Quality Index (AQI) recorded by the Central Pollution Control Board (CPCB) was 360 points in Delhi against 334 on Wednesday -- both considered "very poor", 453 points in Ghaziabad against 443 on Wednesday -- both considered "severe" and 359 (very poor) in Noida against 206 (poor) on Wednesday. Across Delhi-NCR, Anand Vihar in east Delhi, Vasundhara in Ghaziabad and Sector 125 in Noida reeled under "severe-plus" or "emergency" situation, while the air quality was "severe" at Mathura Road in south Delhi, Shadipur in west Delhi, R.K. Puram in south-west Delhi and Delhi Technical University (DTU) in north Delhi. The average value of major pollutant PM2.5 -- or particles in the air with diameter less than 2.5 micrometers -- was 227 units across Delhi-NCR at 7 p.m, which is nine times higher than the safe limit. However, at 10 monitoring stations of the System of Air Quality and Weather Forecasting and Research (SAFAR) across Delhi-NCR, the PM2.5 oscillated between 309 and 443 units -- 12 to 17 times the safe limit. The safe limit for PM2.5 according to the international standards is 25 units per cubic meters and 60 units as per the national standards. According to SAFAR, Delhi-NCR will continue inhaling toxins, with PM2.5 concentration being almost certain to increase over the next three days. 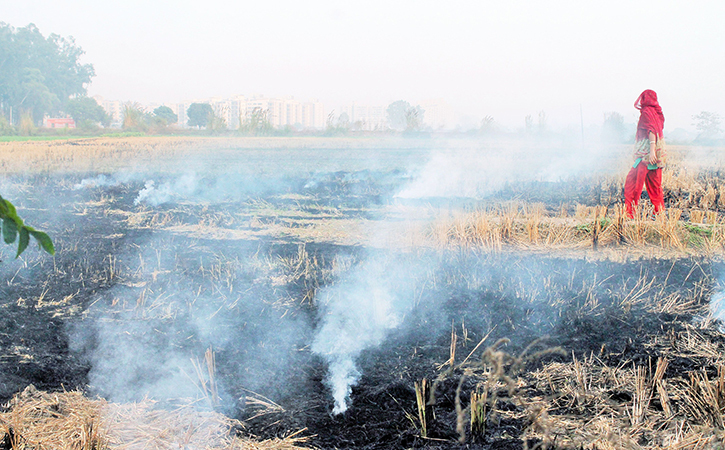 As per the satellite pictures from NASA, the stubble burning goes on even within Delhi, while it continues unabated in Punjab, Haryana and Uttar Pradesh. The weather analysts said following an increase in wind speed in the next four days, the air pollution could see a slight improvement. "The wind direction has changed and speed dropped on Thursday, due to which pollution levels increased. Delhi is receiving north-westerly winds that may continue for next three to four days. "The wind speed is, however, likely to pick up in next four days due to which there is a possibility of marginal improvement in the air quality here," Mahesh Palwat, Director, private weather forecasting agency Skymet, told IANS.